Good to see posts on density, and the up to date density maps are much better than the older versions recently in use. I do think citywide average stats can be misleading, necessary though some people think they are. Wellington must be the classic: it’s two city patterns really, the CBD and inner burbs distinct from the further flung valleys and coast. Averages disguise the strength or weakness of centres, a key factor in transport patterns, and diminish the importance of the dynamics of change in these spatial patterns. Not looked at the paper yet, but did your study map these patterns of change? Having just returned from visiting friends in the outer burbs of Perth, I would observe a large part of their success in PT planning is having land development delivery aligned with PT investments. Auckland has no alignment in this space: visions, planning tools and development delivery are totally unconnected by comparison. New Lynn is the closest we have, a credit to years of WCC work, but is painfully slow and still challenging. Sorry, dumb question on mapping change. What I specifically meant was: did you produce maps of proportionate changes rather than just before and after? Just the before/after maps I’m afraid… although if you take a look at the spreadsheet you should be able to graph the changes between Census years. Excellent work Peter, and I’ll have to have a read of the paper too. This post shows yet another reason why Auckland’s PT network has massive potential to grow and provide a better and more efficient service for the city. I love this measure. Something about area density never sat right with me, and this explains it so simply in a real “but of course!” way. 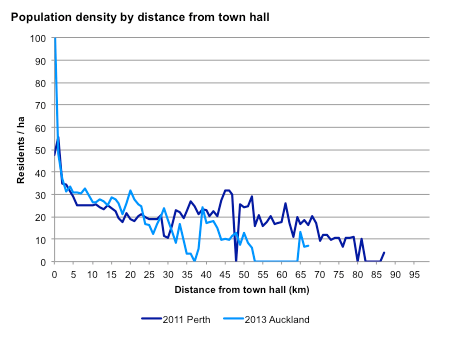 What I would love to see is a infographic type chart that plots Aucklands population weighted density on one side and *number* of people who live at that density on the other, perhaps with a line showing the average area density measure too. I imagine this would show the spread drags the average very low, despite the fact most live much higher. Excellent work, thank you Peter. Really interesting read. Nice to see something other than by Demographia, which always seems a bit suss. One thing I’d be interested to know – how does this relate to other measures of density such as used by the people at AT&T publishers, where they define density as number of habitable dwellings per hectare (from memory). I feel that this is part of the slightly confusing aspect regarding density, whereby people are using different measures / scales. Have you done any work on that aspect? I ultimately decided not to publish figures on dwelling density due to data availability problems. Statistics NZ and the Australian Bureau of Statistics publish detailed information on _occupied_ private dwellings, but don’t release detailed data on unoccupied dwellings. As a result it wasn’t possible to estimate the total number of dwellings in an area. Which is a bit of a shame! Great visuals! Excellent for destroying the myth of density and PT in Auckland. If only we could get people to understand this. Either way great work. Brisbane, Perth and Auckland look to be remarkable comparators. The 2001 v 2013 maps are telling. Look at that leap in density along the CRL route! 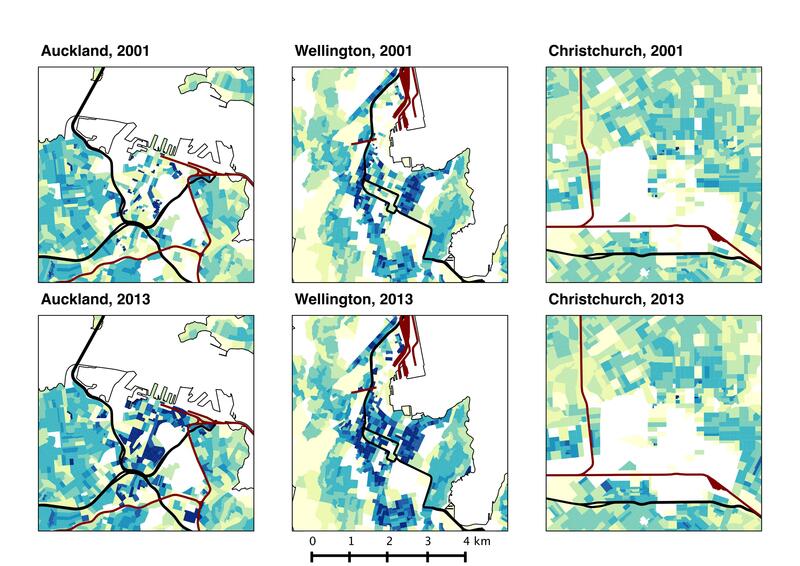 And how persistently dispersed ChCh has been reinforced by the quakes. 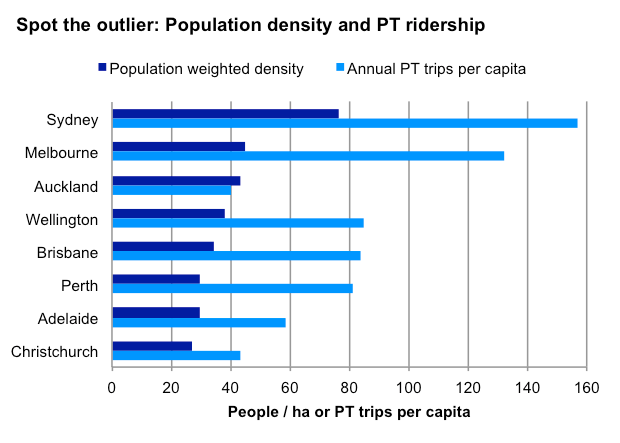 Auckland certainly has the density for PT and seems to underperform on PT for density. It would be interesting also develop an index of the “average topographical challenge” for a city somehow. Crow-flying distances in Auckland (and Wellington) can be OK, but water and/or hills get in the way (especially for rail, which can’t handle steeper inclines). I suspect Auckland is the outlier for PT re: density partly because of topography, but it could be being over-used as an excuse. I can’t tell. I’d actually expect Auckland’s geography to favour efficient public transport services. There are a number of natural “choke points” on the approach to the isthmus – the Harbour Bridge, the SH16 causeway, the narrow bit of land between the Tamaki estuary and Manukau Harbour, etc. These choke points make it hard to provide enough road capacity (or alternative road links). Conversely, they advantage PT by ensuring that there will be a lot of trips on the single corridor through the choke points – i.e. higher cost recovery. How come Melbourne feels much more vibrant and dense than Auckland but the figures are similar? Because there city is built for people. Also if you go to the outer suburbs of Melbourne they are probably worse than Auckland. Tourists to Melbourne only ever see the tram suburbs. I would say Sailor Boy is correct. The prewar city on the rail fingers and tram network is lovely and vibrant, walkable and dense. The other 2/3 of the city is complete sprawlsville. Tourists usually spend all their time in the former, but as someone who used to train and bus to work in an outer business park out in the burbs it is worse than anything Auckland has to offer. Maps confirm the on-the-ground view that Nick and Sailor Boy provide! If you take a look at the maps of the Aussie cities in the paper, you see these vast low-density yellow areas radiating out in all directions. Auckland, by contrast, is a consistently medium-density city. Let’s not be too quick to celebrate the woes of New Zealand’s second-largest city, Patrick! As I’ve said before, NZ’s too small to let any of its urban places fail. Oh Peter that wasn’t the tone I was aiming for. I was trying not to be too critical of its form, as I know there are plenty that believe it’s the best! No worries Patrick… I knew what you meant! Perhaps you’re on to something. It probably is beneficial for New Zealand to have a few different types of cities – ensuring better matching of preferences to places. I’d suggest that Auckland, Wellington, and (to a lesser extent) Dunedin have got momentum when it comes to getting denser and more urban. Let’s let that happen. Tauranga and (perhaps) Hamilton seem to be headed for flatland instead. Fair enough. Christchurch is a bit of a harder case, to my mind. There were signs of rising urbanisation prior to the earthquake, and, as the Crampton article points out, its de-densification since 2011 has been more a result of planning and political failures than market demand. I’d put them in the “wait, see, and hope” category honestly. Finally, it’s essential that people understand THEY HAVE OPTIONS. Don’t like the fact that Auckland’s about to build a proper rail system? Fine – move to a city without one! Yes the Crampton is very good and therefore very very concerning. Even a brief visit there will show that, for anyone like me who considers hyper-dispersal unsustainable, enormous damage has been done to our second city in the name of the rebuild; mandated low quality sprawl. And when I say unsustainable I mean it in the broadest sense, economically as much as ecologically. The fact that this is ideologically driven by vested interests and the local Demographica fan club and reinforced by poor regulation and suspect governance is even more depressing. Patrick we get it that you don’t like Demographia and Hugh Pavletich and you will therefore take every opportunity to denigrate them. But What is happening in Christchurch has nothing to do with the Demographia crowd. Hugh has been ignored by Brownlee, Parker and now Dalziel. Crampton makes that clear as did I here http://www.interest.co.nz/opinion/70493/fridays-top-10-brendon-harr%C3%A9-national-vs-labour-housing-affordability-uk-councils-spy- (no.7). There is more than one way to look at Hugh’s work. There are ways to balance housing affordability with different transport options including PT and a range of housing density choices. You just need to take your blinkers off. A polarised debate is not going to get us anywhere. I acknowledge that Hugh himself takes an extreme position but not every one in the Demographia crowd does. P.S I agree with all your other concerns Patrick. I am worried. Thanks Peter for standing up for Christchurch and thanks for the link. Most balanced read about the Christchurch rebuild that I have encountered. Epsom’s density doesn’t appear to have increased at all in the last 10 years (using a eyeball comparison methodology). Perhaps Labour’s proposed trial of an “RMA-free zone for Epsom” should be implemented. haha… are all ACToids hypocrites or just the ones that speak….? Easily to see this in larger cities, but looking at medium size cities none of them actually show this, especially when give flat land. They tend to be empty near the centre. Maybe the reason Obiter bus route has been successful in Hamilton. 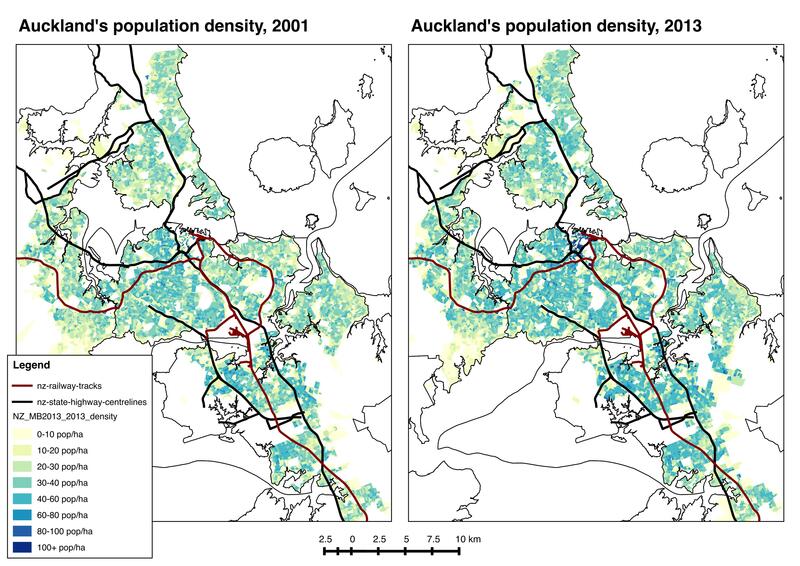 If anyone is interested http://hamiltonurbanblog.co.nz/ has post on pop density of Electorates.